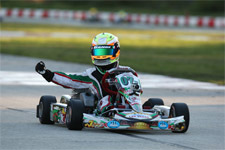 Descending on the Jet Karting of MRP facility in South Bend, Indiana, Sportsman pilot Anthony Gangi Jr. was looking to get back to his winning ways. 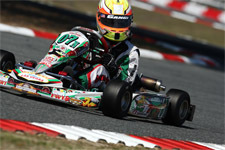 Competing at the fourth round of the World Karting Association (WKA) Manufacturers Cup program, Gangi Jr. steered his Tony Kart chassis to five top-five results including one main event victory to claim a prestigious Grand National Eagle. Utilizing regional series competition the week prior to test for the upcoming national event, Gangi Jr. was able to find his way back to the top step of the podium. After progressing through Friday's practice sessions, Saturday would bring qualifying for three divisions before wheel-to-wheel action would commence. Taking on the Komet Sportsman 1 category first, Gangi Jr. would place his GT7/Tony Kart firmly inside row two in qualifying. A disappointing prefinal would see the New York resident fall back to 11th before a spirited drive in the main event would see the up-and-coming talent drive forward to claim his first top-five of the weekend with a fifth place finish. 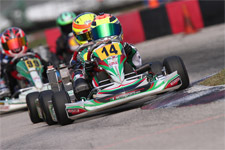 Always a threat for the win in the Cadet Sportsman ranks, Gangi Jr. would once again qualify in the third position. Falling back in the prefinal to claim fourth, the Florida Winter Tour champion drove back to a second place podium result in the main event. In the Yamaha Sportsman class on Saturday, Gangi Jr. would post fast lap in qualifying to take the pole position against a field of 22. Prefinal racing action saw the rising talent drop to fifth, before crossing the stripe in the main first. Later however, Gangi Jr. would be stripped of his win after a disqualification in post-tech due to improper position of the data system sensors. Back on track Sunday with a clean slate, the karting hot shoe started with a fourth place qualifying effort in Komet Sportsman 2. Turning up the wick in racing action, Gangi Jr. would post a win in the prefinal and then go on to score the victory in the final to once again stand atop the WKA podium and claim a Grand National Eagle trophy. 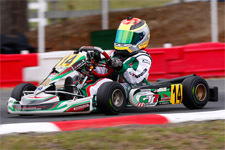 Putting his wet weather skills to the test for Cadet Sportsman 2 qualifying on Sunday, Gangi Jr. would clock second quick to start the prefinal on the front row. A first corner crash in the eight-lap heat relegated Gangi Jr. back to 13th before another spirited drive in the final saw him add a top-five with his fourth place result. In Sunday's Yamaha Sportsman 2, the GT7 Motorsports pilot would post fifth overall during wet conditions and then fall back one position in the prefinal to finish sixth. 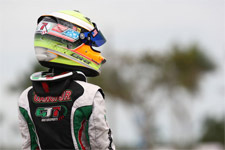 In his final main of the weekend at Jet Karting, Gangi Jr. went on to score another top-five result and make a return to podium presentations with a third place effort. 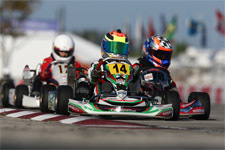 Up next for Gangi Jr. is a trip west to Grand Junction, Colorado for the Superkarts! USA SummerNationals July 19-21 where the Brookville, New York resident will take on the TaG Junior class. 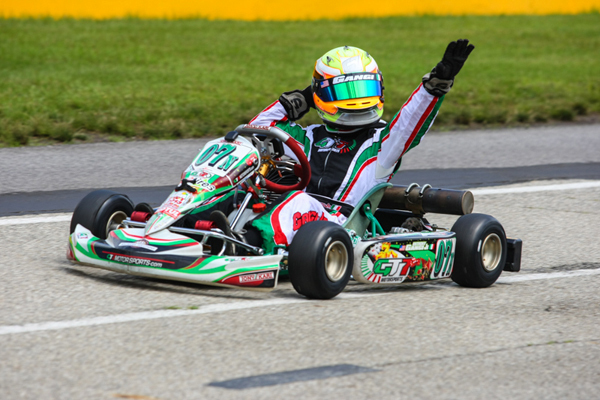 WKA Man Cup action will resume August 16-18 at the Pittsburgh Int'l Race Complex in Waupum, Pennsylvania where Gangi Jr. will make his penultimate push for championship points.